The ‘specification’ is probably the easiest part of the design process although it is one that pupils tend to neglect or write incorrectly. It is usually a list of points, with each point referring to the research work. In the specification you need to show what you have learnt from the research that you collected and presented in the research section. 1. The materials I will use will be compressed polystyrene, pine and MDF because my research clearly shows that this combination will improve my solution. 2. The overall shape will depend on the ergonomics of the hand. I will base the dimensions on statistics worked out as part of my research. 3. I intend to use a colour scheme based on red and blue because the questionnaire I carried out shows these are the most popular colours. 4. The solution will have the following functions: (List exactly what the solution will do). 5. The solution will stand on a desk / fixed on a wall. 7. The solution is aimed at the 12-15 age group as my research suggests this would be the most successful market. Write a specification for a project of your choice. You should be able to list quite a number of points in your specification but always say how your research has helped you. Usually this section is a list of approximately 10 points. The specification is probably the easiest section of a design project, if all the research has been carried out. The specification draws on the information collected and presented during the research section. The specification is a number of straightforward statements, made clearly outlining the nature of the project to be designed and manufactured. If the research section has not been completed fully, the specification will also be lacking. 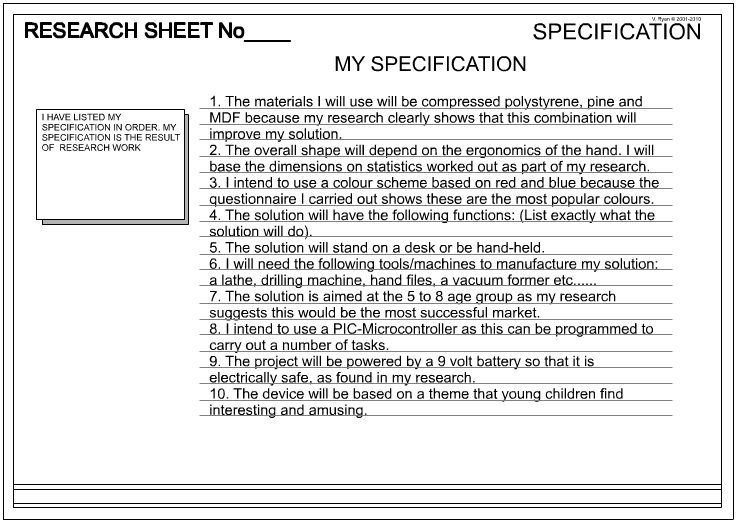 The example specification shown opposite has been written for a project regarding designing a small electronic/mechanical toy for young children. 1. The specification should be composed of simple, clear statements. Keep the statements as short as possible. 2. If possible, always refer to the research you have carried out. For example, “The colour scheme will be based on blue and red as these colours are the most popular - as seen in my questionnaire”. 3. Look at each page of your research and try to write a statement based on each one. Most of the statements in the specification should refer to your research section. 4. Keep the number of statements to between 7 to 8 in total. Specifications should be short and precise in what they state. 5. Each of the statements should help determine the final design of the product. For example, there may be a statement concerning the overall size or weight of the product. This clearly places limits on the design of the product. 6. Ask another pupil or a teacher to read your draft specification. It should be easy for them to form a view of your final product, and describe it back to you. 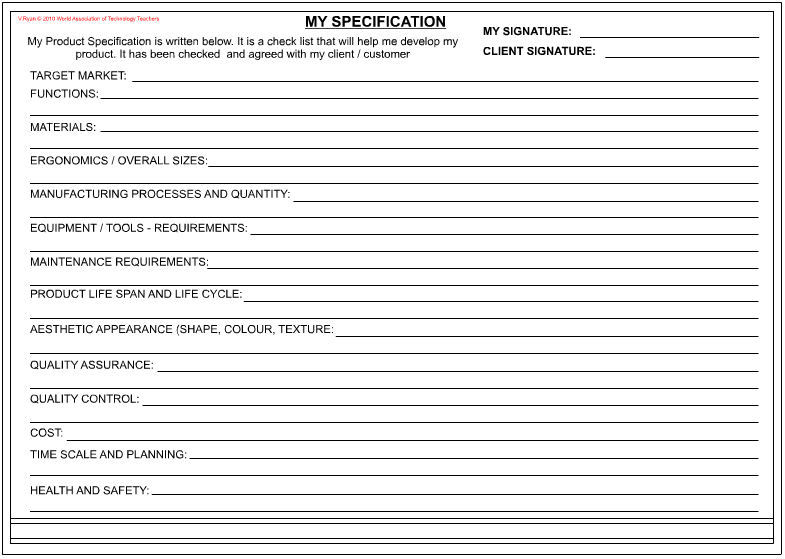 If this description is similar to what you intend for your final product, then your specification is correctly written. 7. Look at the specification written by another pupil attempting the same project. This will help you formulate further statements for your project. 8. The specification should take you no longer than an hour to write, if you have carried out a detailed research. 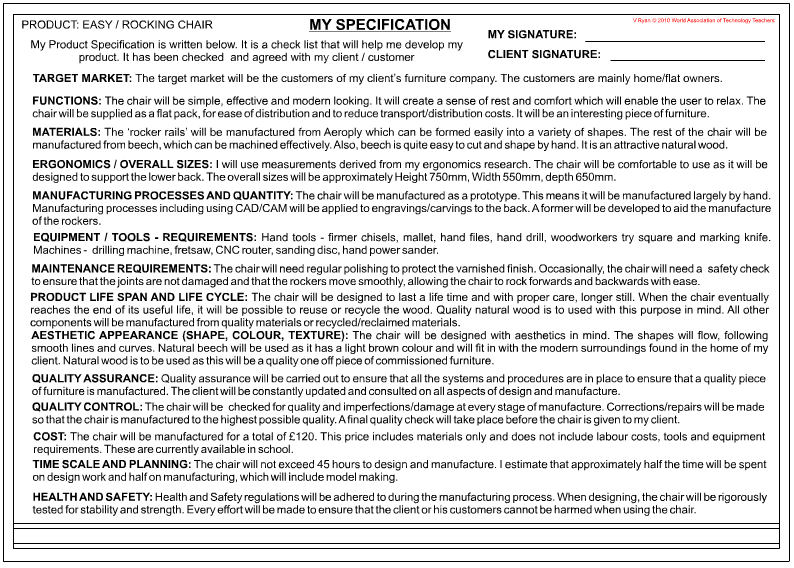 This specification has been written for a rocking chair. A. Write a rough specification first and ask other pupils / teachers to read it. B. Look carefully at each statement and keep the English as clear and simple as possible. C. Limit the statements to between 7 to 12 points (maximum). D. Ensure most points refer directly to your research.